The Indian Chief motorcycle – vintage, “Gilroy,” or new – is a beautiful machine, and because motorcycles don’t get to hide their exhaust systems as cars usually do, the muffler and all its associated gear has to fit in with the overall design, look, and feel of the bike. Whether you’re talking about a vintage Indian Chief or a new one, the basics are the same. The engine puts out hot gases that are routed into tubes. These high pressure gases meet lower-pressure gases, causing sound waves to flow rapidly down the pipe, making a loud noise. Mufflers are designed with resonating chambers that cancel the sound waves made by the engine. As the waves reverberate in the resonating chamber, noises partially cancel each other out, making the bike quieter. Mufflers are designed so that high and low pressure parts of the sound waves coming through the tubes from the engine interact and cancel each other. But in addition to its necessary function, some motorcycle owners want their bikes to have a certain sound. It isn’t just vanity: it helps cars be more aware of the presence of bikes on the road too. So if a motorcyclist wants his or her bike to be louder, they install a muffler that provides less in the way of noise cancellation. One example of a “loud” exhaust system is called a “cherry bomb,” which is a straight tube with holes in it. It is covered by glass to insulate a little of the sound. Since there is no resonance chamber, the motorcycle is really loud. Functionally speaking, a motorcycle with two or four header tubes taking the high pressure gases away from the engine increases gas flow and makes the bike perform more efficiently. They look pretty cool, too. Some people customize their Indian Chief motorcycle exhaust system with a separate muffler and header. A header is specially designed for performance, which requires optimal exhaust gas flow. 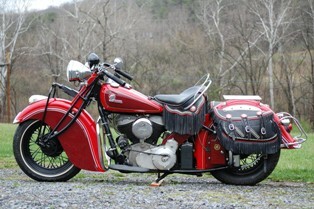 The muffler itself for an Indian Chief motorcycle can involve several options. Slip-on mufflers are inexpensive and easy to install. For regular exhaust systems, accessories like shiny chrome turndown exhaust extensions can add to an exhaust system’s function and attractiveness.